In the Mood for Love is not an over-the-top romance, but rather, has a very deliberate and perceptive way of viewing the nature of romance and how people react to a circumstance that brings about a flood of new emotions. Wong Kar Wai’s craft on display is truly exceptional, as he very astutely deconstructs expectations of what to expect out of his film, as well as what to expect out of a film about love. Give that, it must be understood that so much of In the Mood for Love depends on one’s level of emotional self-awareness. Those not comfortable watching two individuals contend with their spouses infidelity in an atypical fashion will likely be turned off by the film in general. When I had first watched the film several years ago, I admit that I was not able to place myself in any of the character’s position or method of therapy – I appreciated In the Mood for Love for its formal elegance and technical proficiency. But as I watched the film for the second time, I was able to embrace the nuances that Wai provokes on both a formal and visceral level. You gather a truly remarkable level of emotional bravery on his part, largely because you sense that he is allowing his actors to inject their characters with a piece of themselves. Mrs. Chan (Maggie Cheung) inquires about a room in a shared apartment with a loud and rambunctious elderly couple. She gets the room set-up for her and her husband. As she leaves, Mr. Chow (Tony Leung Chui Wai) inquires about the same room. The landlady tells him that she has given it up, but that next door, there might be something available. Mr. Chow prepares to buzz the door, and we immediately cut to Mr. Chow and Mrs. Chan moving in. The scenes and the way they’re put together is crucial, as it accents the tonal development of the entire film. It’s not that the film is paced slowly (because it’s not in the strictest sense), but instead, it’s simply quiet and contemplative in its approach. 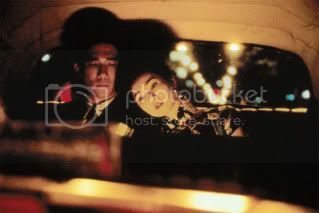 In the Mood for Love does not allow grand gestures of emotional flamboyance, but rather unfolds in a very mannered way. Take the scene where the two couples move in – the chaos of the move has resulted in Mr. Chow having something that belongs to Mrs. Chan’s husband. He goes to her room, briefly explains the situation, and leaves. There’s not an attempt on Wai (or the actors) to secure a “moment” for the two to fall in love. There’s a painful grace to their courtship. It’s unusual, but it speaks volumes as to how true it feels. The restraint that the actors show is visible and palpable. It helps that Wai’s subtleties are more grounded on the emotional level, as his visual imagery serves to help in understanding the narrative’s plight. The actors are constantly shot in claustrophobic situations - with the hallway of their initial encounter serving to highlight their close quarters. When the two venture outdoors, you don’t get a grand sense of where they are. Instead, you typically see Wai shooting from the inside of windows, often times with bars serving as visual cues to establish their imprisoned emotional states. We’re confined to their understanding of the situation, and in that, they’re confined in their world. This second viewing was truly a revelation. Perhaps the timing was just right. The film simply works as an understated but true treatment of emotional confinement and flailing expectations. Wai manages to make the audience aware of his character’s confined emotional states without ever having it spelled out. There’s a fluid poetry to his images, with a lot of it feeling reminiscent of a Haruki Murakami novel. But the picture is wholly Wai’s – the technique, the images, the formal excellence are at their finest.